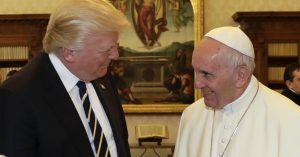 Trump, midway through a grueling nine-day, maiden international journey, called upon the pontiff in a private, 30-minute meeting laden with religious symbolism and ancient protocol. The president, accompanied by his wife and several aides, arrived at the Vatican just after 8 a.m. local time. The president greeted Francis in Sala del Tronetto, the room of the little throne, on the second floor of Apostolic Palace. “We can use peace,” the president responded.